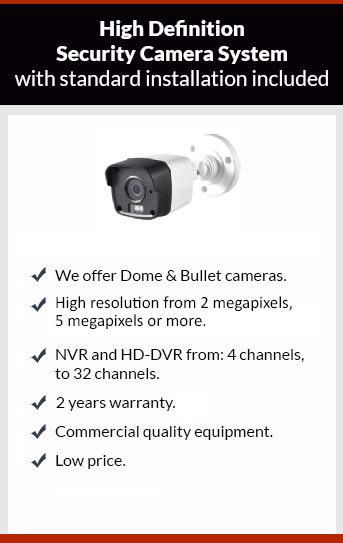 Get affordable Security Camera Installation on Lynwood, CA and CCTV equipment with commercial quality and 2 years warranty. If you are going to make a business trip or you are going away for the holidays, probably it’s time to get another smart home device like a security camera system. Be able to watch your home or business when you are away is one of the biggest trends in smart home devices. Protection4less offers you commercially oriented multi-camera systems that require wiring to work at its best. If you are in the market for a security camera kit they are not a substitute for a professionally security camera that are designed for your needs. All the security camera systems in the market require internet connection to be able to do remote viewing, so this is the first requirement for the security camera installer to provide you of remote monitoring. Our security camera systems use a very friendly free app that have to be installed in your phone for remote viewing. Keep your peace of mind knowing that you have access to your security camera remotely in any place. Give us a call to get your appointment for a technician visit; he will answer all your questions. He will submit a proposal with the best price on the market.